While most couples wanted to grow old together, so many aspects and distractions in life make them grow old alone or with another. Divorce is ugly, but it seems many are opting for that rough road. Better divorced than to live another day with the other in misery or worse. The cause may be the husband or the wife. Nevertheless, the breaking of the vow will affect both. Moreso for the future ex-wife when it comes to the financial aspect because it is the normal and acceptable tradition that men amass money through the years to give to his wife for spending for the home. She often times does the budgeting, but she is not the one earning the money. 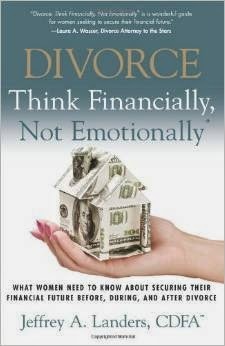 When it comes to divorce, she is left with nothing or close to nothing, unless, of course, she reads the book Divorce: Think Financially, Not Emotionally which is how Jeff Landers has helped thousands of women going through a divorce. Everything a future ex-wife has to know to be financially able to withstand the forces of divorce is revealed in the 216-page book. You do not want to miss this opportunity. It is also a great idea to suggest to someone you know who is undergoing such challenging times. The author is on the ex-wife's side so it is understandable why ex-husbands are now hating this book.